The following is a presentation that was put on at Southern Oregon University as a potluck of foods that represent our persona or character in this world. Organic Navel Oranges … they were picked for this potluck for a number of reasons. In regards to how it might reflect on my character; the color Orange has always been a favorite. It is also the color that comes up when envisioning my birth country; India. The word “Joy” which is also my birth name is associated with the color orange along with the words warmth, heat, sunshine, enthusiasm, creativity, success, encouragement, change, determination, health, stimulation, happiness, fun, enjoyment, balance, sexuality, freedom, expression and fascination … all of which are things I would wish for all of you to experience. However, what really stands out about the Orange is its similarities to being Human. Both have a protective skin around their meat and they both come in all kinds of sizes, shapes and colors and depending on where they are born have different tastes and just like how it is difficult to tell one type of orange from another, if humans were all bald like the orange it would be very much the same for us. They are both dependent on the sun and both go back into the earth, either by being eaten by something else or simply by disintegrating back and blossoming out into the next thing. This is also why organic was chosen, in this way what we put back into the soil through the body of the Orange or Human makes for good rich, healthy, clean soil. If your favorite color happens to be Orange … you are probably … warm, optimistic, and flamboyant. Orange lovers are often friendly, good-natured as well as assertive and determined rather than aggressive – orange lovers are light-hearted and live life based on 'gut reactions.' They are adventurous and love to be outdoors, camping, climbing mountains and taking walks. Orange lovers are often daredevils and are always looking towards the next challenge, the next great adventure. However, orange lovers are often lousy at housekeeping because they love having fun and can be very indecisive, inconsistent and unpredictable. When Orange lovers feel fearful, it is felt in their abdomen, as though it is tied in knots. First it is a very portable fruit. It comes in it’s own casing (show the orange) therefore you do not need to worry about germs or packing. It is named after the Human Navel (show the Navel), which it supposedly looks like. They are available from November to April and the prime season is February and March which means right now they are in their “prime time” … in other words you are getting the best of the best to much on today. The orange is both a literal and symbolic embodiment of the sun, and it is the sun’s light in which it is formed. It also looks like a miniature sun and is a condensation of energy and information from the sunlight, which is placed in us after being eaten. In a sense, you are eating the sun. The color orange is reflective of adventure and social communication. The color orange relates to social communication and stimulating two-way conversations (take the Navel and hand it to someone to pass around). It is considered a warm and inviting color and it is both physically and mentally stimulating as well, therefore, it gets people thinking and talking! The color Orange aids in the assimilation of new ideas and frees the spirit of its limitations, giving us the freedom to be ourselves. At the same time, it encourages self-respect and respect of others. The color orange also offers emotional strength in difficult times and helps one to bounce back from disappoints and despair, as well as assisting in recovery from grief. The color Orange is said to bring out spontaneity and a positive outlook on life and is a great color to use during tough economic times, keeping one motivated and helping one to look on the bright side. With its enthusiasm for life, the color orange relates to adventure and risk-taking, inspiring physical confidence, competition and independence. In psychology they suggest having the color Orange around you (even if it is simply the use of an orange colored pen) as it is an optimistic and uplifting color and is supposed to rejuvenate the spirit. The meaning of the color orange is said to be extroverted and uninhibited. The color orange is also stimulating to the appetite. Many restaurants use pastel versions of orange, for their décor to increase the appetite and promote conversation and social interaction, which in turn encourages customers to have a good time and to eat and drink more. The color orange is the worst color to have in the kitchen if you are trying to lose weight. Orange is one of the most rejected and under-used color of our time. However, young people do respond well to it as it has a degree of youthful impulsiveness to it. In regards to how it can assist you in maintaining good Health. The ancients knew it both as a food and a medicine and now today’s science confirms the orange has a broad range of medicinal properties as well. Oranges, have natural and “complex” sugars which are good for your body and do not cause it to “crash,” unlike “simple” sugars do. 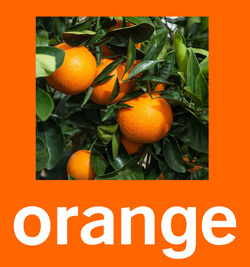 Orange contains multivitamins and flavonoids. Flavonoids are essentially antioxidants and can hinder the symptoms of mild depression. Oranges are a particularly excellent choice because they are filled with vitamin C, which helps your body to produce dopamine. Dopamine is another “feel good” hormone necessary for fighting depression. Eating oranges will also keep your red blood cell count high. If you're looking for a little pick-me-up, you may want to forget the cup of coffee and opt for an orange instead because simply sniffing the fruit can help boost energy and alertness. Orange Peels exhibit Anti-Cancer Properties. Two studies found that orange peel extract has anti-breast cancer properties and helps resist esophageal and stomach cancers and has shown to reduce the risk of arthritis, asthma, Alzheimer's disease, cognitive impairment, Parkinson's disease, macular degeneration, diabetes, gallstones, multiple sclerosis, cholera, gingivitis, optimal lung function, cataracts, ulcerative colitis, Crohn's disease, kidney stones, ulcers and Heart disease. A study found that the Orange scent reduces anxiety and generates a more positive mood. The Vitamin C found in Oranges is also vital for the proper function of a healthy immune system and is good for preventing colds and may be helpful in preventing recurrent ear infections. An orange has anti-inflammatory, anti-tumor and blood clot inhibiting properties as well as the ability to help with learning and memory and has the potential to lower cholesterol. Oranges are a Very Good Source of Fiber and Vitamins A, B and C s well as calcium, copper and potassium. In closing, here is a bit of history about the Navel Orange. It was originally introduced in Australia around 1824 and then Florida in 1835 and are now also grown in California. They started out with a mutation from the original tree, which possibly originated in Portugal. Through the mutation it became seedless, which left it sterile, however, this made the Navel Orange so that it had to be cultivated through graft cuttings, which in turn made the Navel Orange you will or are eating today - the exact same Navel Orange that was eaten 200 years ago … because they are all clones of the original tree. Hopefully, what you have heard about the Navel Orange this morning was interesting, informative and has opened your eyes not only the benefits of eating Oranges, but the benefits to the color Orange as well. Feel free to spread the all good news you have learned about Oranges today!